Discussion in 'Online Games - News and Reviews' started by Marina, Jan 24, 2014.
that has a feature for great winnings, then this one is for you. you have your familiar fruit and number symbols and they've added some additional symbols to give the video slot its' own style. Even the Joker will become your friend in this game. 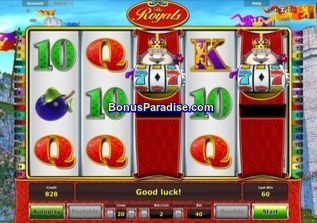 The Royals™ is a 5 reel, 3 row, 20 payline Video Slot. The interface of the video slot is quite easy to navigate. Players can choose the amount of their bet per line by using the - or + sign along with the number of lines you wish to play. For maximum profit, it is best for the player to choose all lines. Amount per spin will vary depending on your choice of coin size. the game. There is an autoplay button that you may use for the reels to spin automatically should you need to step away. The autospin can be stopped at anytime by clicking on it. 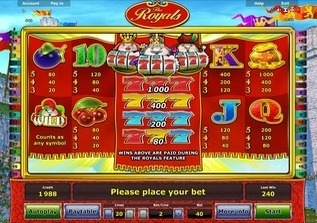 Players also have the choice to gamble a winning payline. Either press the gamble button to double your winnings or press bank to collect. All wins pay left to right. The Wild symbol is the Jester Hat and substitutes for all symbols. The Jester Hat only appears on reels 3, 4 and 5. The Royals™ feature can occur at the end of any spin. Whether it be a winning combination or a losing one. the feature ends and you collect your winnings. Look forward to the release of the The Royals™ in the near future. This is one video slot that you have to play. The Royals™ Online Video Slot is now live at Stargames. I don't think this game will become one of my favorites, but some others may like it and get lucky on it. Good luck if you give The Royals a try.